Sew what's cooking with Joan! : "Me want cookie!!" Cookie Monster Cupcakes! Happy Friday, everyone! I have another cute cupcake recipe I would like to share with you. I made these little guys for our grandma's 92nd birthday. It was really more for the kiddos as I knew they would get a kick out of them. 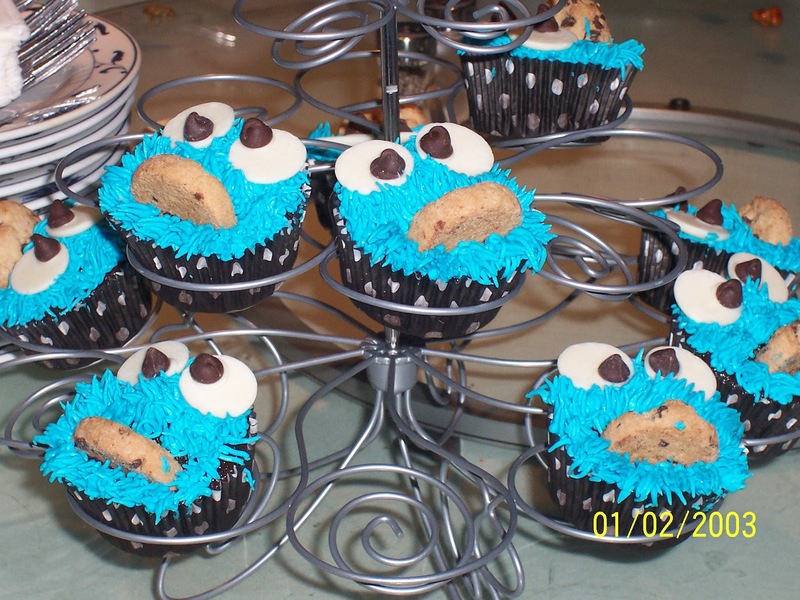 This creative idea came from Robin at www.birdonacake.blogspot.com -she does some amazing things with cupcakes and cakes! Step 1: Once you have whipped up that batch of cupcakes and have let them cool, cut a slit in the bottom half of the cupcake. This is the space you are going to place the cookie. Step 2: Once you have cut your slits, you will place a cookie in each cupcake as pictured below. Step 3: Make your buttercream frosting and color it a nice bright blue. Step 4: Place your blue buttercream in a piping bag fitted with the Wilton tip #233 and pipe frosting fur all over the cupcake. Step 5: Once you have piped fur on all your cupcakes, you can work on putting together the googly eyes! Melt a few candy melts. Put a dab on the back of a chocolate chip, and stick it on the flat side of a candy melt. Make a set of two for each cupcake. Look how cute cookie monster is with his eyes and fur! I just loved making these and look forward to hearing if any of you try making them. I saw a recipe for Elmo and may take a stab at him next! Don't be intimidated to make these, they were super easy! Joan and I are in preparations to take some cake and cookie decorating classes and I look forward to sharing with you the many creations we discover during those courses! Wishing everyone a wonderful weekend and come visit Monday for Joan's "Back to Health Monday"! The kiddos, eight of them went wild! Kelton said, "if I'd have known, I would have worn my cookie monster costume"! Gotta love em! These tasted as good as they look and all 20 disappeared !! Amy you out did yourself, once again! I concur with all the family members, " you're a natural"! Her 6 layer cake, she made for the adult attendees was amazing, she will do a tutorial in the future! Kudos !! Thanks for the kudos!! I am really enjoying contributing to your blog and sharing my love of baking with everyone!